Others think they have plans for you but you keep a memory of your future free. This is one of those books I should hate. Anyone who has seen my reactions to DFW, Bulgakov, Hawkes, et al. (why does “et all” look more correct?) would likely tell me: Don’t bother, Puma; leave this one alone. At another time or in another circumstance, I might feel exactly that way. Its linearity, it storyline, if you will, so jumbled, so askew; conveyed in shreds of dialogue, pulling events forward and backward before ricocheting them along on a tangent, the war story that isn’t but is, the coming of age novel, that isn’t but is; punctuation that adds little or no clarity, partially italicized words, run-on sentences (which, of course, I really like) confuse before opening up. I have visions of a frantic editor throwing up his or her hands and shouting: Who the Hell knows? Told at a breakneck speed which demands reading at a similar pace just to keep one’s head above water. Oh, and tons of water. I couldn’t help thinking, this narrator is suffering from PTSD, something is randomizing his thoughts, making everything urgent, and I still think that’s possible, but this isn’t exactly a war novel, as the blurb suggests. It is, but it isn’t. Not exactly. Unreal becomes real when it hits you. ”I wish I remembered everything you read to me, but I kind of do,” I said. “I remember what I didn’t,” she said. She, in this case, being the narrator’s sister…don’t ask. I said I had taken a hit or two and came out better on a particular dive I had explained the competitive fine points of, though was that even it?—I had taken a hit or two. Five stars—for the fun of it, to be on the right side of (literary) history, for the hits, and most importantly, for Umo, all three-hundred pounds of him. Like most of what I read, this one won’t be for everyone—it’s frustrating, kinda crazy-making, though, for me, well worth the ride. A real, and likely wonderful review by the one, the only (coreader) Spenkerz should follow in the near future; talking this one over with him, albeit briefly, while reading made it even more fun. Which is not to say that I can’t wonder about the saintlike. This one I liked for an entirely selfish and irrelevant reason. C’mon, children, this is a test. See if you can find that solitary moment of self-indulgence writ large. So there you are, and there I am, harmless and forgetful, sharing an author I’ve come to like, although, truth told, I may have been reading Gelman too quickly or too many volumes back to back. This one didn’t quite lead to the exuberance of the first two I read, but I won’t dock this one any stars for faults that are largely, and almost always, my own. In a confused state and while considering what to read next, all the while considering how long it’s taken to inch my way slowly toward my 2013 reading goal, it occurred to me that I might, in fact, kill three birds with a single stone, or book as the case may be, or actually is. Looking through the stacks and shelves of unread titles, trying to determine which might be accomplished quickly, for some unknowable reason Prisoners reared its ugly head—and it is ugly, the cover and the content—but the content is ugly differently, I’ll get back to that. John Hawkes, with direction and discernible plot. Cormac McCarthy, with a sense of humor. Hunter S. Thompson, if he’d written a novel. Burroughs-y. It worked for me. If you’re lucky enough to find a copy, check it out—don’t buy it, necessarily, but check it out. Or better, buy it and give it to someone who will like it. 4.something stars, not to beat a dead … dog, and there is a dead dog. No quotes from this one; it just wouldn’t seem right. At this point I can definitively state that I absolutely, sorta, kinda liked this one a lot. A lot. Not to the point of: Hey, check this one out! But, at the very least, to the point of: You know, you just might like this one. I don’t know. For whatever reason(s), when I see FC2 as the publisher, I expect something edgy, provocative, who knows? But this one is a gentler told, humorous rather than funny, endearing, but with a prevailing intelligent sensibility, sort of novel(?). In Michael Martone’s Michael Martone, Martone presents a series of Contributor’s Notes (42 of ‘em) plus an Acknowledgment, an About the Author, and a Vita, each of which begins: Michael Martone was born in Fort Wayne, Indiana, except for the Acknowledgment and the About the Author. 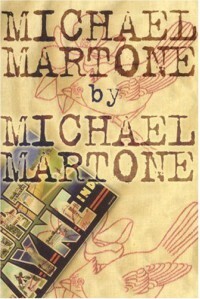 After the introductory phrase, each note takes a variant path and seems to describe multiple Michael Martones, in lives that could not have happened, couldn’t have overlapped, at odds with each other, but, in a way, from and through which, one begins to have a sense of the author, if not as he is, then as how he might want to be known…or not. Did I mention that one of his writing instructors, and one of the blurbers for the writing of Michael Martone, not necessarily for Michael Martone, is John Barth, and that, to some, might matter a lot. It was hard for me not to read this and consider the writing of César Aira, who also will frequently use a character of his own name, and the writing of Enrique Vila-Matas’ Bartleby, & Co., each using his Notes in his preferred manner, and at least one of the Contributor’s Notes must be said to be… hold on, now… wait for it… even though I know a variant of this word is hard for some to swallow…is Kafkavinoesque, in that the Michael Martone presented morphs into a giant bug and the Note begins to repeat itself, as if on a cold winter’s night. What I can’t be sure of…what leaves me feeling as if it was the early ‘70s and I’d just put down the bowl rather than a bookmark, is the sense of literariness I get from other works, something lacking in the totality of its incompleteness (another throwback to an early consciousness). Then, again, sometimes I ramble. Of all the things that hadn’t happened to Martone during his life to that point (both factual and fictional) in which, he believes, nothing much happens or is supposed to happen, this event was as much such nothing as ever happened. Or. Of all the things (both factual and fictional) that haven’t happened to Martone during his life, this event was as much of nothing as he ever experienced. Or. Of all the things (both factual and fictional) that haven’t happened to Martone during his life, nothing more significant than this nothing has ever happened. Or. Nothing more significant than this nothing hasn’t ever happened. For Mother and Father, co-conspirators. It’s a snowy night in late June, and milk is spilling from the broken world’s murdered head. Suppose Woody Allen retold Sade’s The 120 Days of Sodom. No, that’s not quite right, close, but not quite. My father and grandfather got on very well. They liked to sit outside a country inn, tugging at the ivy cascading over the walls and drinking iced patis. And they loved to entertain us children with anecdotes so corrosive to good manners or morals that they made customers sitting at nearby tables blush and rise to leave. In a sequence of horrific and/or horribly crude (though constantly funny) jokes, a father and son (Sebastian and Peter Skeleton, respectively, not respectfully) relate scenes from their lives. Scenes which repeat in altered variation. Repeated like bad jokes that one hears over and over during the course of one’s life. …I have realized that my family history is governed, not by dharma, but by jokes. Call it “joke dharma” if you like. Bad jokes, dirty jokes are, to my world, what the force of gravity is to yours. They shape every event in my life, and in the life of my family. I am not sure why it is so, but it is, I cannot doubt. As a result, I live in a grim mirror world. 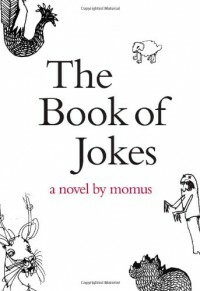 I am a character trapped in a book of jokes—jokes, furthermore, which are in very poor taste. It might begin with embroidery; I add a few details which are not normally included in the rush to the punchline. I must ensure that the story is so well-told that my audience loses interest in the farcical pay-off, the money-shot. I tell the tale several times, from different angles and with different emphases, forcing my listeners to pay attention to small formal questions, adverbs rather than verbs, hows rather than whats. Speaking of ‘adverbs,’ this reads as if written by the Daniel Handler of [b:Adverbs|79129|Adverbs|Daniel Handler|http://d202m5krfqbpi5.cloudfront.net/books/1327729597s/79129.jpg|1230197] fame while attached to an LSD/steroidal drip. 4.something stars, rounded up for its audacity, its Dalkeyness, its outrageously outrageous humor. Not for the squeamish, easily offended, or prudes. 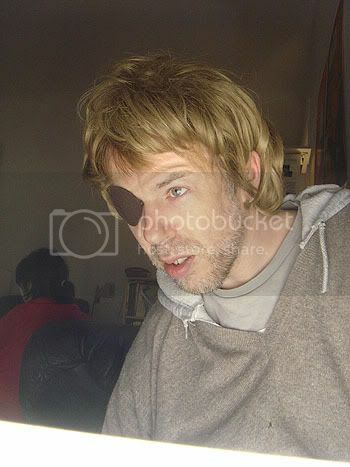 And for the truly inquisitive: Momus on the internets. That cannot be a poem, because it occurred to me while finishing another Juan Gelman, who’s not me, although he used several pseudonyms. 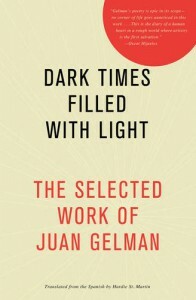 I’ve become quite taken with Juan Gelman—his incredible personal story, his poems, his anger morphed into beauty and forgiveness. I’m less taken with this translator than I was with Hardie St. Martin. To Joan Lindgren’s credit: she provides many more poems, and it isn’t that her translations are bad (how would I know? 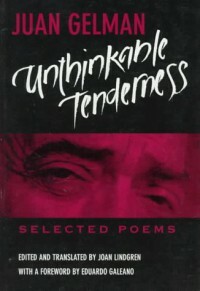 ), it’s just of the poems common to both this volume and [b:Dark Times Filled with Light|15712878|Dark Times Filled with Light|Juan Gelman|http://d202m5krfqbpi5.cloudfront.net/books/1345431382s/15712878.jpg|21380682], I preferred those in the later volume. An excerpt from St. Martin’s translation of Exergue (the entirety may be seen here. translation is something inhuman: no language or face lets itself be translated, you have to leave one beauty intact and supply another to go with it: their lost unity lies ahead. to translate is inhuman—no language or face allows itself to be translated. we must leave this beauty intact and add yet another beauty to accompany it. their lost unity lies ahead. It’s not that they’re so dramatically different, it’s that Lindgren’s conformance to convention (e.g. capitalization of “I” or a “/” at the end of every line in the latter poems) when Gelman, apparently, didn’t, that lends to her versions an element of distance, renders them less intimate. Then, again, I could be blowin’ smoke and just simply prefer St. Martin’s translation over Lindgren’s, and it’s due merely to my own personal wierdnesses. Hopefully, you’ll read one or another or both, and decide for yourselves. I liked this one a little less than my first Gelman experience, but I liked it quite a lot, and I hope you do as well. 4.5 stars, rounded down for that reason only. This volume contains selections from 10 other volumes which I’d very much like to acquire and read soon. Letter to My Mother and Epilogue: An Open Letter to My Grandson or Granddaughter are worth the price of admission (at the time of his writing that open letter, he didn’t know whether the child of his murdered son was male of female). Check Gelman out; he’s considered to be in the Nobel running. Let me know if I’m correct in my appreciation or a just a sentimental softie, or both. I can take it. Briefly: they are two short stories, after all. Well, a novella and a short story. But why quibble? My quibble is with the publisher, and this bugs the hell out of me, as prior to this one I’ve loved the New Directions Pearls series. More on that to follow. 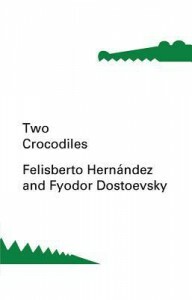 Fyodor Dostoevsky’s The Crocodile: An Extraordinary Incident is a satire, and as such, perhaps, should not (cannot) be expected to attain the status of the author’s better known, canonical works. A low-level Russian bureaucrat in the 1860s (?) visits an arcade with his wife and friend to see a travelling exhibit containing the first crocodile to be brought to Russia, whereupon he is consumed by said crocodile, and from which, he issues directives to his friend about his plans for the future, the comfort of the croc’s insides, and the ‘principles of economics’ which are at play. By the time the novella’s finished, the friend’s real affections are discovered, newspaper reports are confused, and the wife…well, I’m not one for spoilers. Constance Garnet’s translation sounds exactly like what one might expect from someone who’d stopped translating in the 1920s: stilted, archaic. Her heart was in the right place, but her dictionaries and thesauri were someplace else. By the time story ended, I was seeing it black and white and expecting an appearance by Rod Serling. Those who think Bulgakov is funny (it has that feel) will likely appreciate this more than I did. New Directions, it seems to me, blew it on this Pearls volume. A dated translation of Dostoyevsky and the lack of copy editing on the Hernández story were disappointing. It may be an inexpensive way to publish something, but really, “That year, I starting weeping in the west…” Really? Disappointing, made more so by learning that the next volume in the Pearls series is by Bulgakov. Morphine. I’ll read it, but expectations aren’t great. With some luck, they’ll use a contemporary translation and spring for an editor. We’ll see. 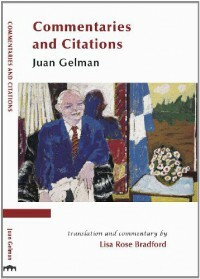 Argentine septuagenarian poet, Juan Gelman, has had a life that would overwhelm most people and leave them in despair. 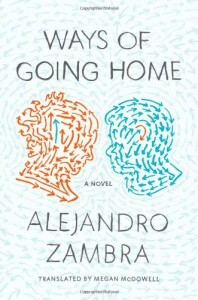 Instead, in the wake of a life fraught with loss (loss of country, loss of his only son [whose tortured body he had to identify] and daughter-in-law ‘disappeared’ during the Argentine “Dirty War,” the loss of a granddaughter probably born in a prison hospital before being given to a pro-government family, the loss of many, too many, compañeros), Juan Gelman writes the most engaging, optimistic, accessible poetry informed by those losses, informed by love—of country, of people, of peace. Never maudlin or self-pitying, never the perverse pride of boastful ‘look what I’ve overcome,’ always humble, always gentle, horrifically informed while genuinely hope-filled. I’m not a poetry guy. Anyone who’s read many of my reviews knows it. It’s been exceedingly easy to relegate most of the poetry I’ve encountered to the realms of incomprehensibility and/or pretentiousness. I am, however, susceptible to the poetic, vulnerable to the well-said. The poems in this collection caught me up and urged me through them at a pace that demands revisiting, repeated revisits that I look forward to. Absolutely compelling and easy to recommend. Try them. Of all trades, I’ve chose one that isn’t mine. when illness weighs down my hands. everything makes me work with words, with blood. obscure faces write my verses like bullets firing at death. i call the following poems com/positions because I’ve com/posed them, in other words, put my own things in texts great poets wrote centuries ago. obviously i wasn’t trying to improve them, their vision of exile shook me up and i added—or changed, went through, offered—the things i myself felt, as contemporaneousness or companionship? mine with theirs? the other way around? tenants of the same condition? in any case, i talked with them, as they did with me from the dust of their bones and the radiance of their words. i don’t know which to honor more: the beauty of their poems or the vital voice that composed them. but, the two combine to offer me that past, surround my present and give me a future. such is the mystery of the human word. it has its origin, whatever the language, in the same flight between darkness and light and thus it consubstantiates them: its light is dark, its darkness bright. with each tongue, with each human group it opened a mouth to make flight possible, follow its slow movement at all times, see how it develops and has to be worked out. that’s what the tower of babel was all about: not essential discord but a partial science of the word. reality has a thousand faces and each, its own voice. science, but also patience to let the face and its word rise from the fear that binds them all the way to the love that will unite them. time and its pain, burn deep in the night where each word is a cold sar, a sun that is still to come. So 5 stars it is—in accordance with my own rating 4 stars because I liked it, and the fifth because I read it at the right time. I hope you check Gelman out, I also hope you like him. It must have something to do with the presence of the paragraph. That which makes it obvious that one isn’t reading poetry. The paragraph, distinguished from those lines of eneven lengths, which may or may not rhyme. The presence of paragraphs, that tell me, just maybe, I’ll be able to understand what I’m preparing to read. Wonderful, wonderful paragraphs. But, there are those damned prose poems. Those deceptive paragraphs which, may or may not, yield up meaning, or understanding, or anything that a reader who’s almost exclusively drawn to prose might expect (hope for?). 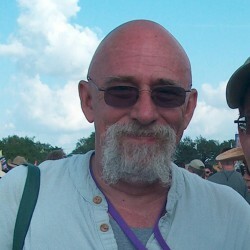 The familiar made alien by inclusion in the prose poem. And sometimes, sometimes, the familiar made alien is exactly what one wanted without knowing it. Exactly what was needed at a particular time. Exactly…perfect. 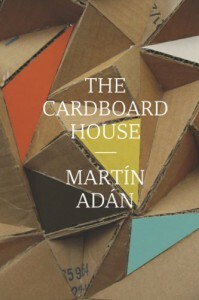 In Martín Adán’s The Cardboard House, readers are treated to the sensations, memories, reflections of a narrator whose family vacationed in the Barranco section of Lima, once a seaside resort, more recently (like the fortunes of the narrator’s family) fallen into disrepair. It’s the story of first loves, friends, friendly rivalry, tourists, loss, and so, so much more. Minus, of course, the story, which is only suggested, hinted at, revealed in its absence. A story the way a poet might tell it. This afternoon, the world is a potato in a sack. The sack is a small, white, dusty sky, like the small sacks used for carrying flour. The world is little, dark, gritty, as if just harvested in some unknown agricultural infinity. I have gone to the countryside to see the clouds and the alfalfa fields. But I have gone almost at night, and I will no longer be able to smell the smells of the afternoon, tactile, that are smelled through the skin. Out of its dusty whiteness, the sky—affiliated with the vanguard—creates round, multicolored clouds that at times look like German balls and at others, really, like the clouds of Norah Borges. Now I have to smell colors. And the road I take turns into a crossroads. And the four pathways born to the road screech like newborn babes: they want to be rocked, and the wind turns into a swinging young dandy after nightfall and does not want to rock roads: the air puts on oxford trousers, and there is no way to convince it that it is not a man. I walk away from the sky. And, as I leave the country side, surrounded by urbanizations, I notice the countryside is in the sky: a flock of fat, fleecy clouds—award winners at the Exposition—romp about in the green sky. And this I see from far away, so far away that I get into bed to sweat colors. 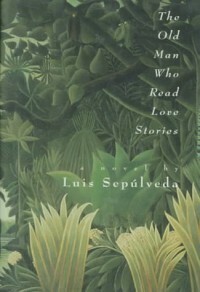 I’ve read most of this novel twice. It made two trips to Michigan with me. I abused it. Set it down, picked it up, set it down, picked it up again. Bookmark after bookmark. Repeatedly, before starting over and plowing through it. Different from other Aira novels, seemingly, more complicated, less resolved, confusing. Like being buffeted by the wind on the Patagonian plain. So much going on. A writer (Aira?) sits at a Parisian café and works on a novel he’s considered for some time. 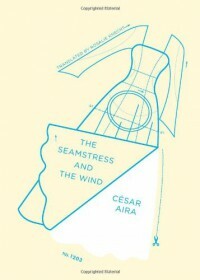 He’s wanted to write about a seamstress and the wind. Which he does. And which he includes. There’s a story there. But, once again, I’m not convinced the story is the story. Like my reaction to other Aira novels, the other story is about writing. And for me, that’s enough. Writing. Wonderful writing. With characteristic Aira flair. Pith. Wanderings. My parents were realistic people, enemies of fantasy. They judged everything by work, their universal standard for measuring their fellow man. Everything else hung on that criterion, which I inherited wholly and without question; I have always venerated work above all else; work is my god and my universal judge, but I neverworked, because I never need to, and my passion exempted me from working because of a bad conscience or a fear of what others might say. …to see a mad woman going mad. It’s like seeing God. All this may seem very surreal, but that’s not my fault. 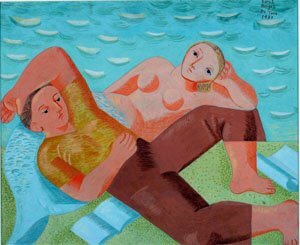 I realize it seems like an accumulation of absurd elements, in keeping with the surrealist method, a way of attaining a scene of pure invention without the work of inventing it. So many years have passed that by now it must be Tuesday! He was in boxer shorts and an undershirt, hairy, unkempt, and with the face of a man who had few friends. The only thing that seemed to be in its place was the time, although not even the late dawn in that place had a particular time: one could call it a lapse in eternity. Difficult to recommend , except to a few. Something between 4 and 5 stars (for me; you’re under no obligation) rounded up, because I can. Themes of time, memory, loss, family, death, space, and writing—stitched together brilliantly. Always, with Aira, wonderful writing. Real reviews can be found through the following links: the lauditory, the cautionary, and the informative—believe them all. My, my, my, my, my. Not one for the casual reader. Briefly: My, my, my, my, my. Less briefly: A tale told in high register, of arrogance and honor, the fine lines between conflicting emotions, irony, Oxford University, the righteous and the self-righteous, the femme fatale, fantasy meeting reality, anticipatory metafiction—wondrously frustrating and frequently comic, keep a dictionary at hand (a good one). Cormac McCarthy meets Jane Austen, or Bartleby, the Scrivener in extremis. 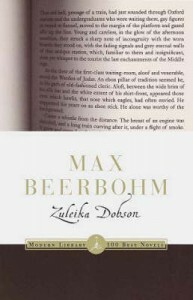 Prophetically: More Beerbohm in my future. Briefly. Very briefly, as the two poems which comprise this pamphlet total a mere 56 pages. 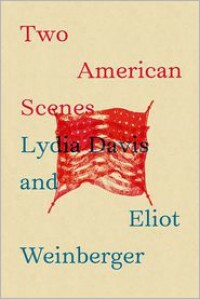 Two contemporary, and by most standards, highly regarded American writers, Lydia Davis and Eliot Weinberger, consider two very different regions of the country during approximately the same time period—the mid-1800s. In Davis’ poem Our Village, the author reconsiders, edits and expands, the journals of her great-great grandmother’s brother, Sydney Brooks, published by the Norwich Historical Society, and presents that version in what looks like a poem (lines of irregular length, stacked one upon another) which suffer not one iota when simply read slowly considering the words as they appear, as an extended piece on a different time and place. Very nice. I should warn, however, for those already perplexed by poetry and its various forms, what makes this a poem may simply be the contained within the parenthetical above. On the other hand, what do I know? In Weinberger’s A Journey on the Colorado River  an expedition travels by raft or canoe exploring the Grand Canyon and naming locations for their perceptions of or reaction to the various locations, in lines interspersed with lines from hymns and perhaps other unidentified sources. It took a little googling, but many of the locations identified are actually along the Green River and the hymnal excerpts, included for their beauty and appropriateness (never in apparent religious awe), aren’t identified as such, and only their appearance in italics suggest they’re part of some other works. Each of the poems are interesting in their own ways, although what makes the one a poem isn’t apparent, to me, and the other seems blatantly a poem, as what else could it be? For completist fans of the authors, although perhaps not the finest writing of either. A very tentative ‘perhaps’ as I’m well out of my element here. I liked and am glad to have read each, but I’ll take Davis’ prose or Weinberger’s essays any day. 3.5 stars rounded up, because I’m all too generous, and for the writer’s efforts. A vast chamber carved out of the rock, a little grove of box-elder and cottonwoods at the entrance; a deep, clear pool of water, bordered with verdure at one end. A thousand feet above, a narrow, winding skylight. The rock at the ceiling is hard, the rock below soft and friable—thus the great chamber was excavated by a little stream that only runs when the rain falls, so rarely, in this arid country. We camp in the chamber. The rock is full of sounds as though it were an academy of music deigned by an unknown architect and built by storms. We name it Music Temple. You could say that I wished them all the best in the world, as if they were characters in a novel or a film for whom one is rooting right from the start, knowing that something bad is going to happen to them, that at some point, things will go horribly wrong, otherwise there would be no novel or film. … They were the brief, modest spectacle that lifted my mood before I went to work at the publishing house to wrestle with my megalomaniac boss and his horrible authors. So is the sentiment expressed by the narrator. These real people she doesn’t know have captured her heart and imagination, like fictional characters, so much easier to take than those who make their livings in publishing. Nicely played, JM, premising the real on the fictive to distance the real. Nice indeed. So I leapt in. Reading…reading…uh, okay…reading, wondering, reading. Something seemed off: was it the voice of the female protagonist, as my first inclination suggested? Was it that she sounded so much like Marías himself? Hmm. Not good. But, I am liking this. It keeps me going. I like what the story is about, and I like what the book is about. (I’ll return to that) In my haste to get going on the new Marías, I’d forgotten the characteristic authorial voice, or rather hadn’t forgotten it. The familiar digressive wanderings were present in spades, constantly wandering, speculating, making suggestions to me. It wasn’t until reaching the final section of the novel that the voices, for me, congealed. And it wasn’t that the narrator became credible as a woman. Or that she became credible as Woman. Rather, she became credible as human—as real—that place where fiction and my perception/reception of it matters. Part voice, part character. Part authorial and the ever-appreciated translator (I want to know Margaret Jull Costa; I want to talk to her for hours) and part making sense of what’s provided—the text. What had been disparate, coalesced. I’d had my doubts, and was proven wrong—like characters in the story—who had their own certainties, until they no longer had them. Seeds had been planted. This is a mystery, of sorts. The blurb prefers ‘existential mystery’ and I can live with that as well. But, it also much more. It’s about the mysterious: Love and Death, Memory, Guilt and Complicity, Murder (“a murder, nothing more”). Like so many authors I’ve come to love reading and look forward to, their books are as much about writing and the story-telling process (I said I’d get back to what the book was about) as they are the story. 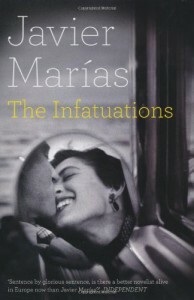 Where other writers use metafiction, Marías gently tugs at its hemline or shirtsleeves. It’s about allusion and its difference from intertextuality . It’s about Balzac’s Colonel Chabert (in a big way) and Shakespeare’s Macbeth and Dumas’ The Three Muskateers and Marías’ Bad Nature and Tomorrow in the Battle Think on Me, and probably a great deal more of what he’s written to date. It’s also about the author making fun of his profession and professional aspirations and affectations. Good stuff. On the fourteenth day, he phoned my mobile when I was in a meeting with Eugenie and a semi-young author recommended to us by Garay Fontina as a reward for the adulation bestowed on him by the former in his blog and in a specialized literary review of which he was editor, ‘specialized’ meaning pretentious and marginal. His uncertainty did not last long and he soon regained his composure. Having scanned his memory and found no very clear evidence there, he must have thought that, basically, regardless of what I knew or didn’t know, I was entirely dependent on him now, as one always is on the person doing the telling, for he is the one who decides where to begin and where to end, what to reveal and suggest and keep silent about, when to tell the truth and when to lie or whether to combine the two so that neither is recognizable, or whether to deceive with the truth, as I had initially suspected he was trying to do with me, no, it’s not that difficult, you just have to present your story in such a way that it seems unbelievable or so hard to believe that your listener ends up rejecting it. Unlikely truths are useful and life is full of them, far more than the very worst of novels, no novel would ever dare give houseroom to the infinite number of chances and coincidences that can occur in a single lifetime, let alone all those that have already occurred and continue to occur. It’s quite shameful the way reality imposes no limits on itself. And I could not help considering from a hundred different angles (or perhaps it was only ten angles repeated over and over) what Díaz-Verela had told me, his two versions, if they were two versions, and pondering details that had remained unclear in both, for there is no story, whether real or invented, without blind spots or contradictions or obscurities or mistakes, and in that respect—that of the darkness that surrounds and encircles any narrative—it didn’t really matter which was which. When you don’t know what to believe, when you’re not prepared to play the amateur detective, then you get tired and dismiss the entire business, you let it go, you stop thinking and wash your hands of the truth or of the whole tangled mess—which comes to the same thing. The truth is never clear, it’s always a tangled mess. Even when you get to the bottom of it. But in real life almost no one needs to find the truth or devote himself to investigating anything, that only happens in puerile novels. How easy it is to introduce doubts into someone else’s mind. 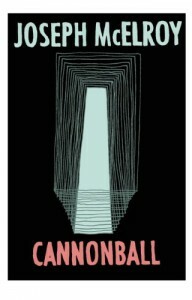 Somewhere between 4 and 5 stars, rounded up because, whatever else this novel has accomplished, it demands to be reread. 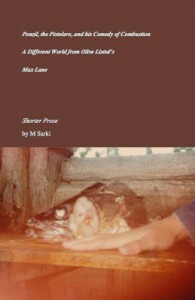 In Shorter Prose, poet M. Sarki (yeah, that one; many of you know him) draws on small town life in Tawas City and East Tawas, Michigan, and memories of mid-twentieth century, small town life amid characters who seem to know everyone, in the sense that ‘everyone’ means ‘each other.’ Having, myself, grown up in a village near a small town where we were all bussed off to school, the stories provoke a similar love/hate nostalgia for that simpler life and that simpler period. That is not to say that the stories in Shorter Prose are historical fiction—they’re not—it is to say that memories reside with us no matter how we might try to shake them or how far from our origins we might travel. In Ponzil, the Pistolero, and His Comedy of Combustion, Ponzil, the narrator, equates being ‘stupid,’ which he hears he is from townspeople and his father, with being ‘thin skinned,’ which was presumably avowed by the doctor who delivered him. Told at what feels a breakneck pace, Ponzil confuses facts from his past, cites important philosophers, and following an incident in a bar, reference to two notorious murderers, and the apposition in the title, this reader began to suspect something sinister, ominous—but I wouldn’t want to provide a spoiler, and I definitely wouldn’t want to affirm the consequent. With A Different World than Olive Listed, a boy’s memories of being bullied and sense of isolation lead to other relationships as memorable, and in Max Lane, memories of a small town immigrant, a memory not uncommon to those of us of a certain age and rural origin, ignite our own memories of those odd characters from our youth—that old man and woman with their accents and still-alien traits, their otherworldliness, their otherness. Each of these pieces (I hesitate using ‘stories’) deal with memories, the ways memories endure. I’m reluctant to call them stories, in that they seem more than that—they are stories, but they’re successful stories because of the Voice with which they’re told. They work at the level of narration. It’s exactly that Voice which prevents they’re being told another way. In the best writing, Milton’s right words, in the right order are part and parcel of that sense of voice we readers expect…that sense of right words in the right order often best accomplished by a poet. 4.5 stars, rounded up, not only for the writing, but in anticipation of the 5 I’ll be able to give to More Shorter Prose when it appears.